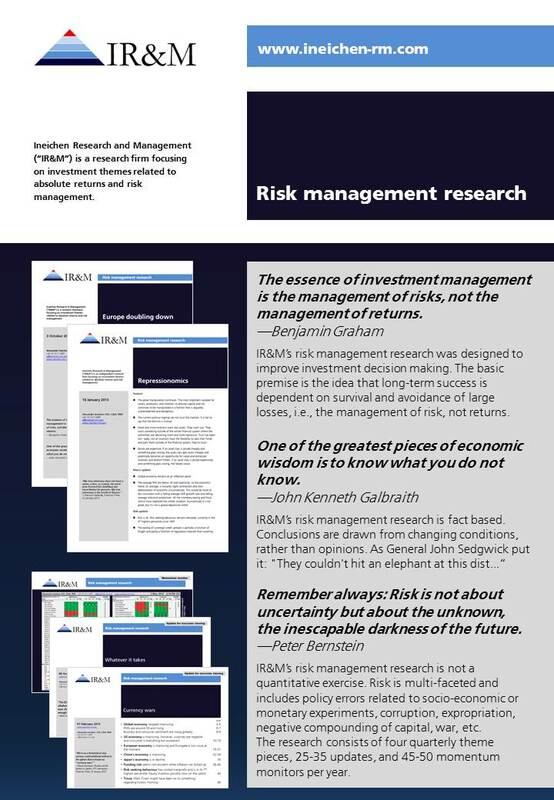 Our risk management research is subscription based and is targeted at the institutional/professional investor. Institutional investors can send email including their affiliation to office (at) ineichen-rm (dot) com for free three month trial. A 22-page introduction to the main offering can be found here. A two-page flyer can be found here. A five-page article on "nowcasting" as a risk management tool can be found here. Subscribers get roughly one email per week. The research consists of 3-4 thematic reports (20-80 pages), 15-25 risk management updates (main part of offering, 60-100 pages, landscape format for screen viewing), 25-50 flash updates (1-25 pages), 25-40 earnings momentum monitors (3 pages), and 45-50 momentum monitors (5-7 pages) per year. Distribution is via email. Below some samples. Risk management update. We do 15-25 of these per year. This is our main offering. Nowcasting and financial wizardry. We do 3-4 of these reports per year. Flash update. A shorter update of which we do 25-50 per year. Earnings momentum monitor; an ad-on publication. We do 25-40 of these per year. Europe doubling down, October 2011, inaugural report. Explains purpose and investment philosophy. 20th Century Volatility - A review of the stock and derivatives markets in the 20th Century, Warburg Dillon Read, December 1999. We conclude the report with an outlook for the next 100 years. If our predictions do not materialise until the next derivatives century-review is due, the author will take full responsibility. Our conclusions are intended to be thought provoking. Some readers, however, might regard them as fatuous or even ludicrous – probably as fatuous and ludicrous as a rational economic agent viewed the contemporary in December 1899 who stated that inflation would top 10,000% in Berlin and the conversion of Karl Marx’s theories into the real world would cost 100m lives during the next 100 years. Managing the Curve - Improving risk-adjusted returns, UBS Warburg, September 2002. Putting it crudely, managers of skill-based strategies manage the curve, while managers of market-based strategies do not. By ‘the curve’ we mean the dispersion of returns around the mean, that is, volatility and other absolute measures for risk. If the sole goal of the portfolio manager is to beat a market benchmark, the risk of the portfolio is almost entirely driven by the market. In other words, the relative return manager is active with respect to exploiting investment opportunities, but passive with respect to managing risk. This report is designed to make the point that active managers should be active in both tasks: seeking return by exploiting investment opportunities as well as managing the curve. The value added by an active manager is a function of skill and investment opportunities. It is clear that more opportunities means more value added with the same level of skill. In other words, a manager with positive skill will be able to add more value if he manages the curve. Managing the curve actively means more opportunities to add value. The manager will be in the position to reflect his view on stocks more accurately by running different risk profiles and changing these risk profiles based on the analysed information. The increased flexibility of using stock options results in more opportunities.